is in motion with the developement of the E-Z Stand! Check out the latest in taxidermy products, supplies and other items of interest. John Morley, New York taxidermist and the owner of Realistic Mounts Taxidermy since 1988, introduced a unique taxidermy mounting stand called the E-Z Stand in the summer of 2005. Says John, "Fellow taxidermist, once you mount something on the E-Z Stand you will never mount anything on any other stand. The E-Z Stand rotates around 3 axis (360 degrees x 360 degrees x 190 degrees minimum) all WITHOUT any tooling, no bolts to loosen, no levers to push, no pins to deal with NUTTIN! Move it to where you want it and it stays there. The E-Z Stand is unlike any other taxidermy mounting stand available. The E-Z Stand will save you valuable time when changing positions.  Just move the form to ANY position you desire and it stays there. 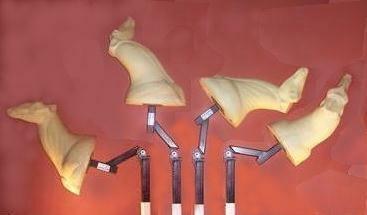 The E-Z Stand will improve your quality of taxidermy work by allowing you to position your work piece in ANY position. With the E-Z Stand you will no longer find yourself arching, bending, twisting or straining to get YOURSELF into position to work on a nostril, an ear canal, tear duct, or an incision. Just move the piece to where you want IT and it stays there - all without a single tool required. Looks simple and it is, except it required the right materials and design - it is Patented! Available in a bench model (you need a sturdy bench), or a floor model. The floor model needs to be secured (concrete anchor bolts or lag bolts). The floor model can also be mounted onto a steel wheel that is filled with concrete - this makes for a portable stand. When the stand is not in use it requires an 8" x 8" space. The stand is E coated to prevent rust. The E-Z Stand has been tested to withstand over 10,000 movements without failure. Current size will handle up to and including deer heads, other sizes coming soon. Ask about our 30 day money back guarantee." 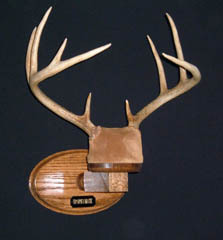 The TROPHYMATE™ mounting system is a revolutionary new deer antler display method. This classy display fits well into the trophy room, den, your office or even in the living room. Crafted from fine quality oak wood and hand finished this classy display will win the approval of the lady of the house to be placed where you and all your friends can see your trophy. 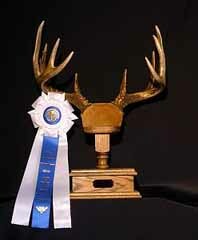 The award winning Trophymate Desk Mount is uniquely designed to mount antlers in the upright position. The Trophymate Wall Mount, just released this summer, is the newest wall mount on the market.